Larkspur, Lupine, Camas, Shooting Star, and Sego. Botanist and those familiar with Idaho flora will recognize these as the common names of wildflowers. Throughout the Spring and summer, the mountains and meadows surrounding Stanley are adorned with these blooming beauties, exploding with an array of colorful displays. Right now it is winter, and the flowers that once painted the landscape are nothing more than decaying matter, their seeds sown to the wind. As the snow piles up around the valley, all that remains of these flowers are their names inscribed on the trails of Park Creek. 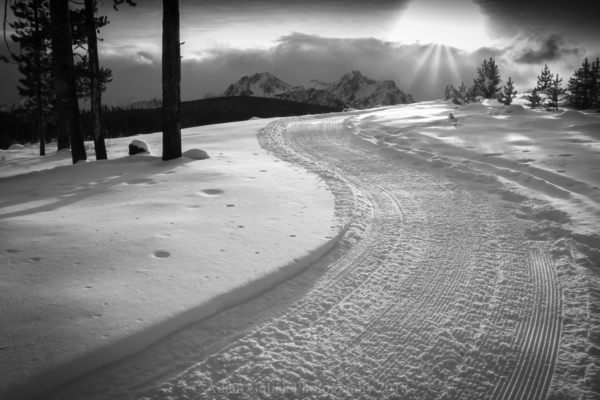 I’m not only the author of this blog but the trail groomer for Stanley’s winter recreation area, known as Park Creek Ski Trails. Those who have visited the Park Creek know it is a place of magic and mystery. 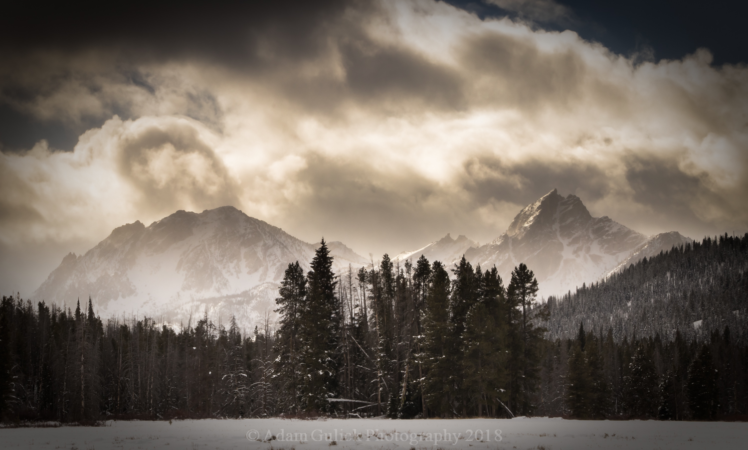 The lodgepole stands and long meandering meadows once home to lush vegetation, wildflowers, grazing elk and the hustle and bustle of bees and skeeters, now sits still, frozen in winter’s blanket. The newly transformed landscape beckons the winter adventurer and the wild at heart. Park Creek Ski Area is roughly 7.5 miles west of Stanley off highway 21. The parking area and gateway to the trails, overlooks Park Creek meandering through a long meadow surrounded by the scorched lodgepole stand of the 2016 Dry Creek Fire. Elk Mountain sits at the southwest boundary, where the waters of Park Creek and Dry Creek originate. On a clear day, one can see beyond Elk mountain, deep up Stanley Lake Creek a passage into the Sawtooth Wilderness. 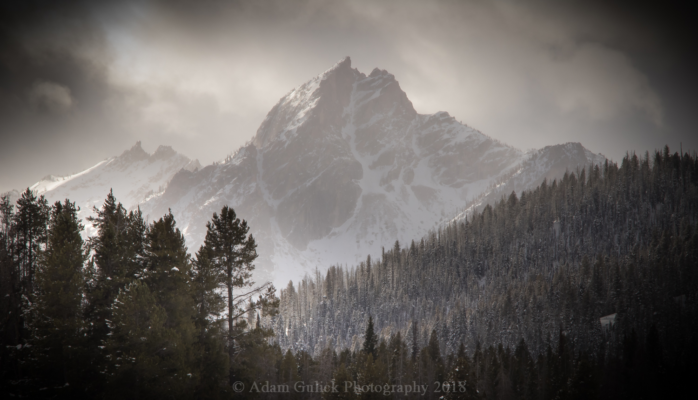 On the East side of the drainage sits McGowan Peak; not the tallest of the Sawtooth Range, topping out at 9820 feet, but iconic and majestic all the same. Further East of McGown, the granite dome of Mystery Mountain sits guard. Alpine, Williams, and Thompson peaks, along with the jagged spires and towers of the Sawtooths fade South, down the range. The first trail out of the parking area is Lupine Loop. Named after the common purple legume that paints the rolling sagebrush hills in the summer, is now the gateway to a winter wonderland. This short loop is perfect for the beginner, a quick afternoon ski, or the start of a greater journey. Lupine Loop returns via the sled hill below the parking lot, but the wildflowers of winter grow deeper into the park. Heading westward, up park creek, the trail branches as the meadow narrows. Turn left along the creek for Camas Loop trail, or hang right up Shooting Star, named after the violet and yellow flower that shoots up from the marshy meadows in the spring. After ¾ of a mile, Shooting Star rejoins Camas loop. Hang left to return to the trailhead, or take a right, where the trail skirts the parameter of a wide-open meadow, a lake of snow, at the foot of Elk Mountain. McGown and Mystery jut up from the edge of the timber. This is my favorite spot in the Park. Camas Loop hooks east back toward the forest edge, to the junction of the Sego trail. 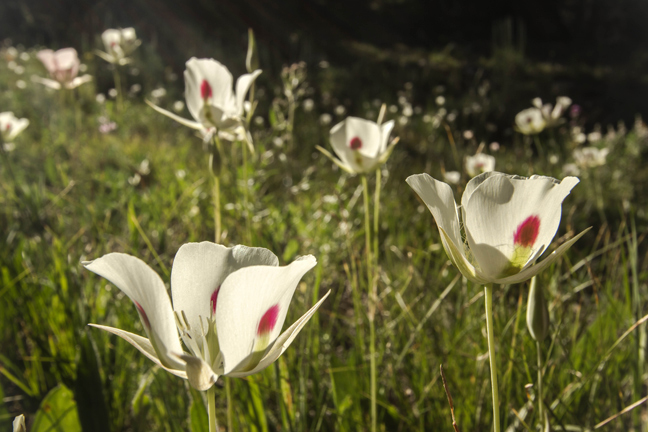 The Sego Lily is a single white blossom with a brush stroke of blushing red. Sego trail slips into the lodgepole pines at the foot of Elk Mountain. The snow grows deeper back here and it is not unheard of to find wolf tracks crossing from the pack moving off the mountain. Sego dips in and out of the lodgepole, grazing a few small openings, eventually emerging at the top of Dry Creek and a three-way junction. Continue down Dry Creek on Larkspur trail, named after the dark purple poisonous mountain blossom, or head left up to the ridge above to Skyrocket trail. Also known as Scarlet Gila, Skyrocket is a favorite among hummingbirds and butterflies. In the winter it mostly attracts winter adventurers, seeking the scenic vistas above Dry Creek. Enjoy expansive views of the Sawtooth Range as you ski the corduroy trail along the spine of the ridge through the heart of the park. Skyrocket and Larkspur rejoin and return North, dipping back down to Park Creek and the trailhead. 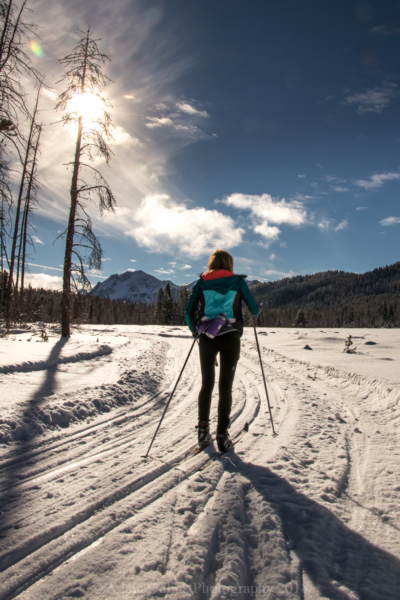 In addition to Park Creek, The Alturas Lake Ski Area, 20 miles south of Stanley, offers many more trails with stunning views of the southern Sawtooths and White Cloud Mountains. 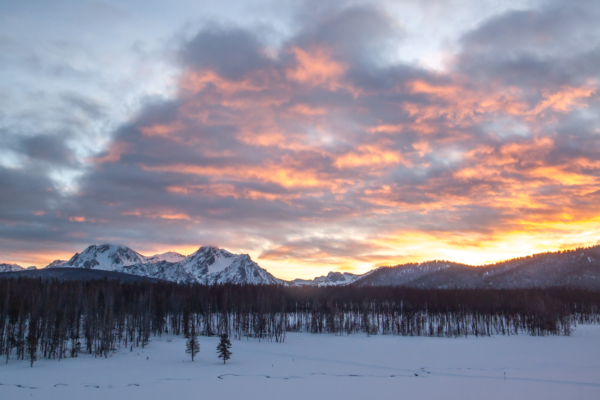 If skiing isn’t your cup of tea, Stanley is the hub to millions of acres of wilderness, backcountry ski terrain, hundreds of miles of snowmobile trails, natural hot springs, wildlife and some the best sunsets in the west. Stanley is a year-round recreation destination. For Park Creek Ski Trail map and winter recreation maps: http://stanleycc.org/Do/Skiing For lodging follow this link: https://stanleycc.org/Sleep/Hotels-Motels For dining: http://stanleycc.org/Eat. Come play in Stanley this Winter!